A case of multiple molluscum fibrosum. Description : 179-181 p. ; ill.: 1 phot. ; 26 cm. Photograph : 1 photoengraving in-text (unverified). 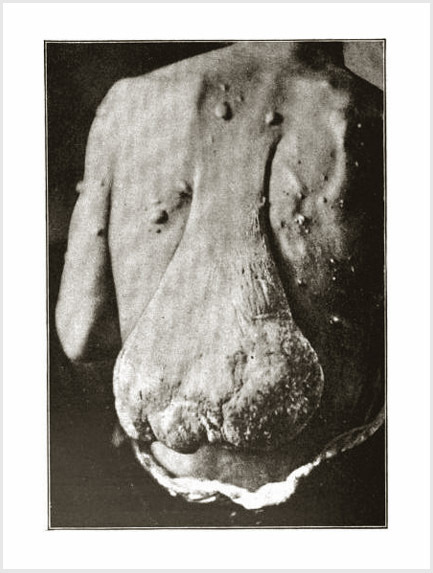 Subject : Skin — Multiple neurofibromatosis. Author caption: By E. T. TAPPEY, A. M., M. D., Surgeon to the Harper Hospital, Detroit, Mich.
Medical degree, N.Y. College of Physicians and Surgeons, 1879. I SEND herewith a photograph of a very beautiful example of molluscum fibrosum. The patient is a colored man, aged thirty-two, by occupation a laborer; he has been filling the position of fireman on one of our ferry-boats for the past three or four years. He thinks the large tumor which is shown in the photograph has been developing ever since birth; that there was a small tumor in that part of the body when he was born. —Page 179.